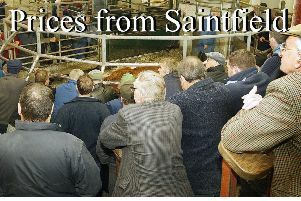 An entry of 550 cattle at Markethil on Saturday, January 26th continued to sell in a very good trade in all rings. The highlight of the day was a Limousin cow and heifer calf from an Augher farmer sold at £2,750 other suckler outfits sold from £1,400 to £1,900 each. The 190 heifers continued to sell in an excellent trade with good quality heavy heifers selling from £200 to £220 per 100 kilos for 526k at £1,155 from a Banbridge farmer and for 558k Blonde d’Aquitaine at £1,225 from a Dromore producer. Top price £1,385 for a 656k Charolais £211 from a Forkhill producer. Good quality middleweight heifers sold from £200 to £263 per 100 kilos for 428k Limousin at £1,125 from a Lisburn farmer followed by £262 for 426k at £1,115 from a Lisburn farmer. Second quality heifers sold from £175 to £185 per 100 kilos. Banbridge farmer 526k, £1,155 £220.00; Dromore farmer 558k, £1,225, £220.00; Annalong farmer 506k, £1,105, £218.00; Armagh farmer 504k, £1,085, £215.00; Hillsborough farmer 514k, £1,105, £215.00; Banbridge farmer 524k, £1,125, £215.00; Rathfriland farmer 544k, £1,165, £214.00; Armagh farmer 508k, £1,085, £214.00 and Armagh farmer 518k, £1,105, £213.00. Lisburn farmer 428k, £1,125, £263.00; Lisburn farmer 426k, £1,115, £262.00; Lisburn farmer 458k, £1,135, £248.00; Banbridge farmer 464k, £1,025, £221.00; Mayobridge farmer 30k, £835, £220.00; Markethill farmer 416k, £885, £213.00; Markethill farmer 414k, £865, £209.00; Banbridge farmer 422k, £875, £207.00 and Mayobridge farmer 460k, £945, £205.00. 150 bullocks met a steady trade. Good quality forward bullocks from £200 to £228 for 558k Charolais at £1,265 from a Keady farmer followed by £219 per 100 kilos for 618k Charolais at £1,355 from a Keady farmer. Good quality middleweights from £200 to £236 per 100 kilos for 430k Charolais at £1,015 from a Sixmilecross farmer followed by £229 per 100 kilos for 426k Limousin at £975 from a Richhill producer. Good quality Friesian bullocks sold from £140 to £173 for 516k at £895 from a Dromore farmer. Keady farmer 556k, £1,265, £228.00; Keady farmer 618k, £1,355, £219.00; Lisburn farmer 518k, £1,125, £217.00; Keady farmer 520k, £1,115, £214.00; Keady farmer 564k, £1,205, £214.00; Keady farmer 580k, £1,235, £213.00; Lisburn farmer 508k, £1,075, £212.00; Newry farmer 514k, £1,085, £211.00 and Richhill farmer 530k, £1,115, £210.00. Sixemilecross farmer 430k, £1,015, £236.00; Richhill farmer 426k, £975, £229.00; Belleek farmer 440k, £985, £224.00; Richhill farmer 460k, £1,015, £221.00; Richhill farmer 466k, £1,025, £220.00; Armagh farmer 490k, £1,075, £219.00; Richhill farmer 480k, £1,045, £218.00; Richhill farmer 448k, £975, £218.00 and Richhill farmer 462k, £995, £215.00. Dromore farmer 516k, £895, £173.00; Dromore farmer 574k, £965, £168.00; Belleeks farmer 536k, £845, £158.00; Markethill farmer 686k, £1,075, £157.00 and Loughgall farmer 638k, £985, £154.00. Another good entry of 200 weanlings sold in an excellent trade. Light male weanlings sold steadily from £250 to £315 per 100 kilos for 254k Charolais at £800 from a Lisnaskea farmer followed by £299 per 100 kilos for 268k Limousin at £800 from a Lurgan producer. Stronger male weanlings sold from £200 to £243 for 432k Limousin at £1,050 for a Poyntzpass farmer followed by £238 for 470k Charolais at £1120 from a Silverbridge producer. Poyntzpass farmer 432k, £1,050, £243.00; Silverbridge farmer 470k, £1,120, £238.00; Banbridge farmer 452k, £1,015, £225.00; Moira farmer 424k, £940, £222.00; Moira farmer 428k, £935, £218.00; Banbridge farmer 426k, £920, £216.00; Banbridge farmer 454k, £980, £216.00 and Silverbridge farmer 446k, £940, £211.00. Newtownhamilton farmer 192k, £630, £328.00; Lisnaskea farmer 254k, £800, £315.00; Lurgan farmer 268k, £800, £299.00; Newtownhamilton farmer 262k, £770, £294.00; Crossmaglen farmer 226k, £650, £288.00; Lisburn farmer 222k, £630, £284.00; Silverbridge farmer 320k, £905, £283.00; Lisnaskea farmer 306k, £860, £281.00; Milford farmer 316k, £840, £266.00 and Lisnaskea farmer 308k, £800, £260.00. Silverbridge farmer 242k, £655, £271.00; Tassagh farmer 352k, £950, £270.00; Tassagh farmer 302k, £795, £263.00; Newry farmer 304k, £770, £253.00; Tassagh farmer 314k, £790, £252.00; Tassagh farmer 316k, £790, £250.00; Tassagh farmer 394k, £965, £245.00; Tasagh farmer 310k, £740, £238.00; Tassagh farmer 314k, £740, £236.00 and Silverbridge farmer 340k, £790, £232.00.